Nakapiripirit- The Uganda Wildlife Authority (UWA) last week translocated 95 Impalas from Lake Mburo national park to Pian-Upe game reserve under Mt Elgon conservation area in Nakapiripirit District. UWA senior manager veterinary services Unit, Dr Patrick Atimnedi flagged off the transnight journey on Sunday.A total of 95 Impalas 53 females and 41 males have now been translocated to boost tourism. “The translocation exercise is part of UWA’s objectives to diversify wildlife species and boost tourism in Lake Mburo National Park,” Dr Atimnedi told PML Daily on Friday. Mr Peter Mbwebwe, the tourism manager for Mt Elgon National Park received the animals at Pien-Upe game reserve. Mr Mbwebwe said the initiative is also aimed at controlling the population of Impalas in Lake Mburo National Park as animals are moved to different areas where they can feed and breed freely. “Introducing the impalas in Pien-Upe game reserve will help diversify wildlife and consequently, attract tourists but it must also be noted that Pien-Upe had Impalas in the past and they just underwent extinction, so we are replacing them,” said Mr Mbwebwe. He said Pien-Upe has been without impala species since the government’s-led project to convert land just south of the Greek River for agriculture threatened the viability of wildlife conservation in the whole area. Mr Fred Kizza, UWA’s Mt Elgon conservation area manager [Chief Warden], told PML that ecological studies and research regarding the survival of the impalas had been conducted before the relocation exercise to ensure the safety of the animals. He noted that Pien-Upe game reserve is well endowed with shrubs and Acacia trees which are food for the giraffes. UWA management teamed up with the UWA animal relocation rangers to carry out the translocation with the transportation equipment. The relocation process took about a month, where the Impalas were captured and taken to a monitoring place. Here, veterinary doctors monitored the strength and adaptability of the animals at Lake Mburo national park to travel. 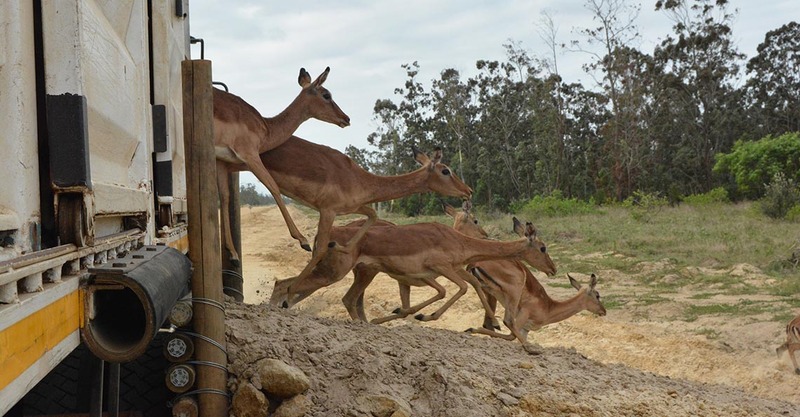 At Pien-Upe the Impalas were monitored before being released into the wild to start their new lives.